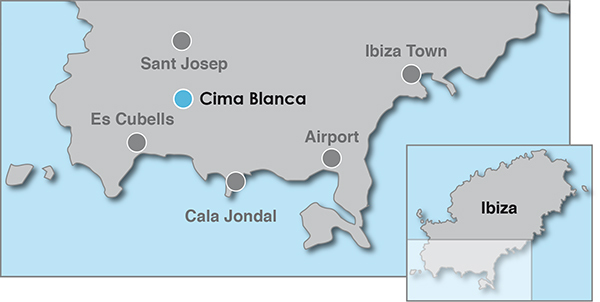 The beautiful Cima Blanca, literally translating as ‘the white top’, is a stunning addition to our villa portfolio. 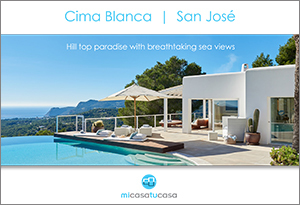 The recently renovated property sits in rustic privacy at the top of a pine covered ridge in between the pretty village of San Jose and Ibiza’s south coast , and the views are quite simply breathtaking. From nearly all areas of the property you can enjoy a 180 degree vista of the striking coastline below. But Cima Blanca is not only about the view. It has been stylishly renovated and decorated to create a wonderful villa for friends or family to enjoy a very special holiday. The accommodation is spread out over two floors and an annex . The open plan entrance , living, kitchen and dining area is on the main upper floor. The villa has four well sized bedrooms all with en-suite bathroom and sea view, so there should be no fighting over room selection. The master bedroom is on the main upper floor. You go down a comfortable spiral stone staircase to the two lower floor bedrooms which have a large connecting living area. The lower floor bedrooms open out to a grass lawn. There is another living room , guest WC and en-suite bedroom (not internally connected) in the poolside annex which is only 10m from the main house. Tourist License Registration No. 16692.